Snoop on the other hand is a “Cult of Personality”. No that’s not just the name of a song from the 90s band Living Color. It means a creation that is molded to attract a following. Hitler was a great “Cult of Personality” as is “Obama”. They get by on their Charisma. In Snoop Dog’s case, he’s basically talentless but he enjoys getting high. A LOT! Snoop is not acting. He’s just the kid on the playground that had the first set of Nikes and that made him cool. Soon everybody wanted to hang out with the Nike kid. Then when everybody else got Nikes, Snoop probably had to have Jordan’s. So all of the kids that had Nikes were envious of the “cool kid” because he had Jordans. Dr. Seuss wrote a book called Sneetches on Beaches. 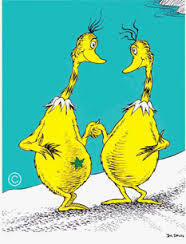 It was a book about Dr. Seuss creatures (The ones that look like the Grinch) only one set of Sneetches had a Star on their chest and they were the superior Sneetches. They were special. Soon a snake oil salesman comes into town and has a machine that will put stars on the other Sneetches’ chest for a dollar. Soon all of the Sneetches on the Beach had stars. So the original Starred Sneetches wanted to be different from the fake Sneetches so the Snake oil Salesman had a function on his machine that could remove the Star. (For a dollar) Soon nobody knew who was who. Snoop was amongst the first rappers to openly use expletives in every other syllable and kids thought this was cool. Then other rappers came and tried to outdo Snoop. So just like the Sneetches, Snoop decided his new “Thang” would be his love for Pot. He’s no different from a wrestler looking for that new image, or Larry the Cable guy saying: “Getter done”. Or for that matter a Sneetch with a Star. 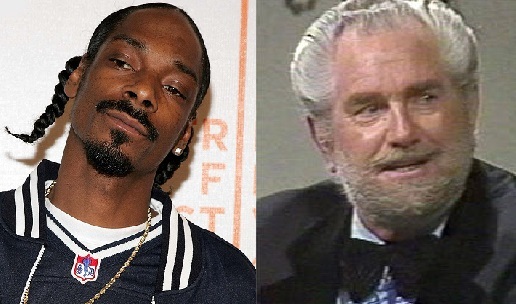 On the other hand, Foster Brooks was a great Actor and not an alcoholic.